Nearly every seat in the house was filled at the start of the sale, with more seating located on the balcony. SPARKS, MD. – A constant rain tapped the roof of the Gorsuch Barn as bidders settled in for Crocker Farm’s 451-lot July 21 sale. 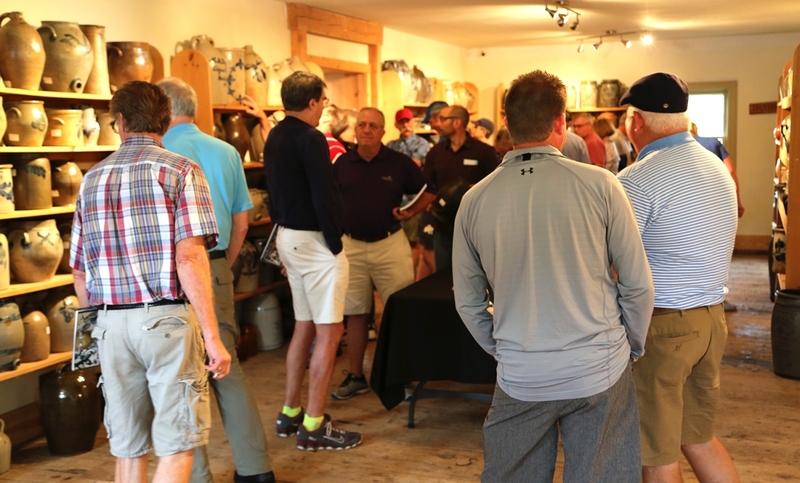 The morning preview culminated in a full house, with nary a seat left empty and close to every single object on the shelves turned and felt over. Pottery has that unique rebirth in the grasp of collectors, whose hands simulate the very way many of these pieces were thrown into form as they check them for chips, touch ups and fillings. 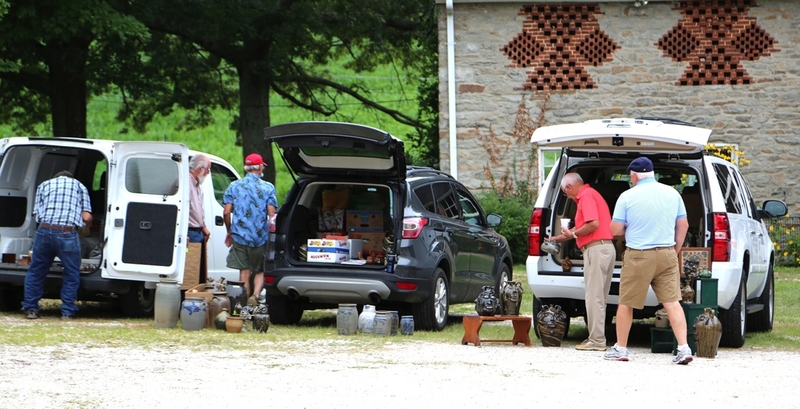 The sale was hailed a success by principal Mark Zipp, who said, “I felt like the sale had strong prices all the way around. It really bodes well for the market of quality stoneware and redware. 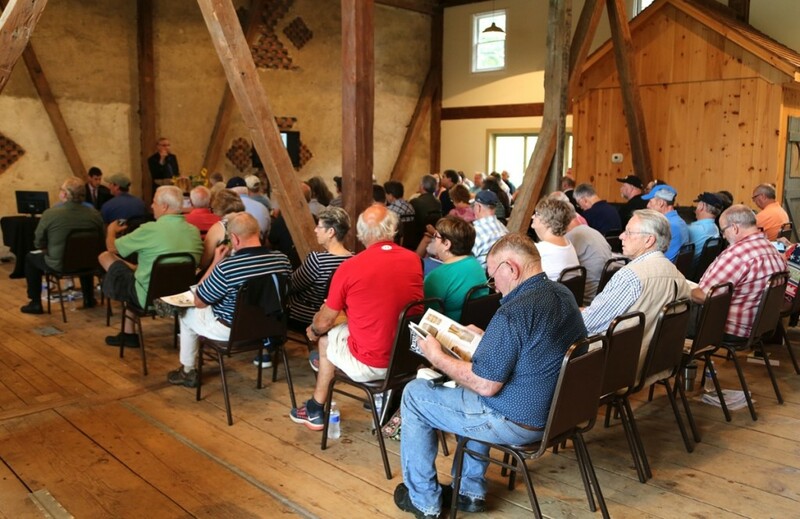 Overall, we were happy.” The sale totaled $738,343 with a 99.4 percent sell-through rate. 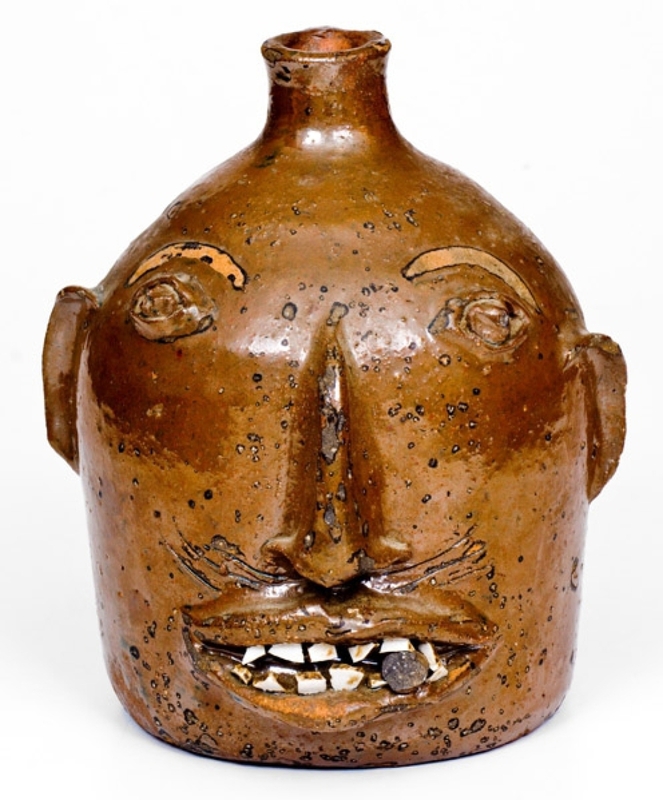 The top lot of the day was an $82,600 result for an Anna Pottery fair jug that had a lot to say. 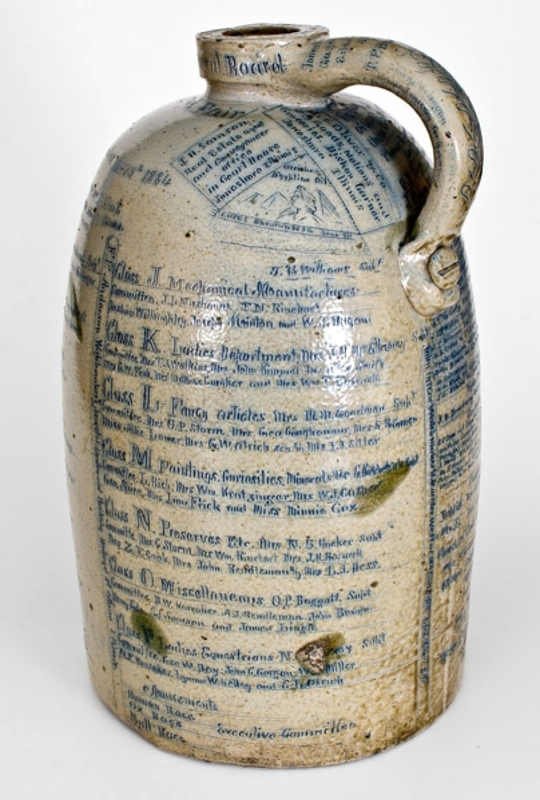 The 19½-inch-high stoneware single-handle jug featured all-over cobalt incising and documented the 29th annual fair put on by the Jonesboro Agricultural Board, September 16-22, 1884, in Jonesboro, Ill. It sold to a phone bidder. “They were fascinated with blanketing the surface, so this is an example of that,” Zipp said as we looked over the jug at the preview. At 132 years old, the jug was as solid as the day it was made, requiring two hands and a wince to rotate it to read the far side. 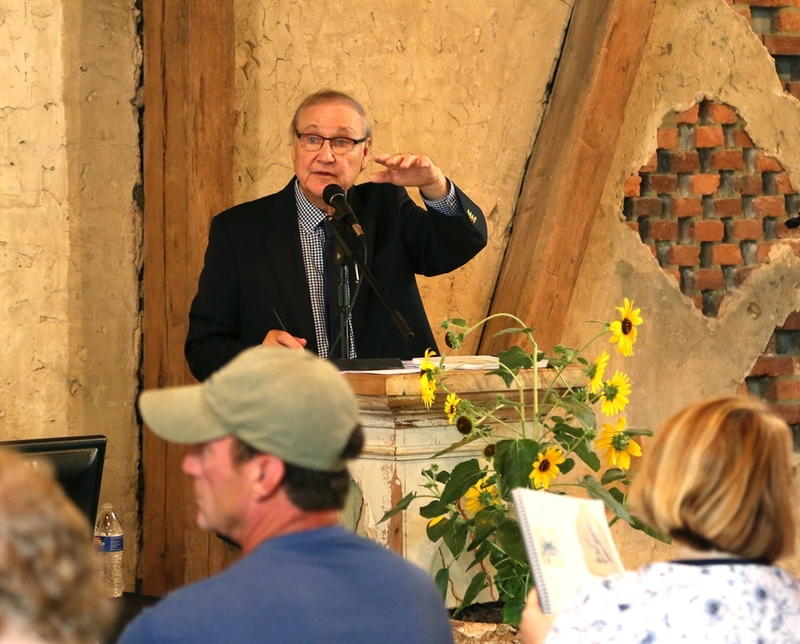 The writing on the piece detailed the assembled categories to be judged and their assigned committee members – everything from horses, mules, cattle and hogs to grains, fruits, mechanical manufactures and fancy articles. 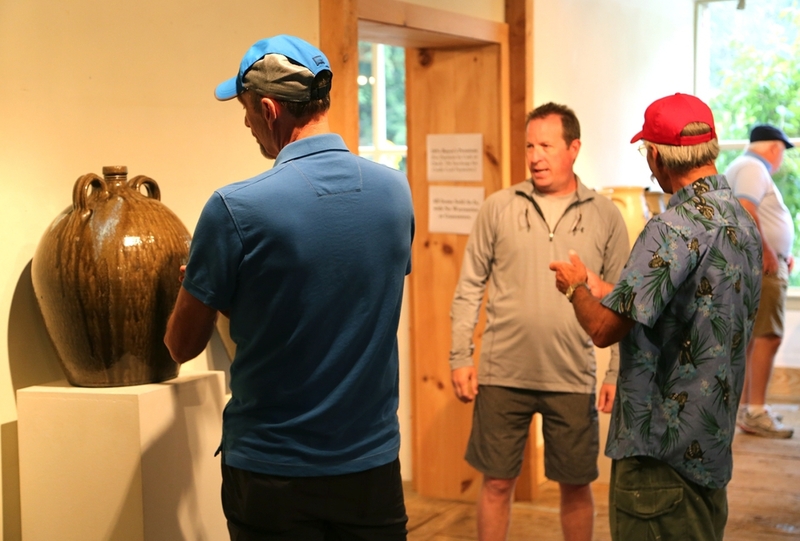 Speaking to the potter’s involvement in the fair, Cornwall Kirkpatrick was listed formally as the superintendent of Class M, the paintings, curiosities and minerals category. In addition, plenty of advertising was found all over, including endorsements for state and local politicians, their local newspaper, The Talk, and a pictorial advertisement beneath the mouth, which featured a pyramid and a sphinx for Otriches Egyptian Oil, a local Anna, Illinois-made product that advertised a cure for Rheumatism. 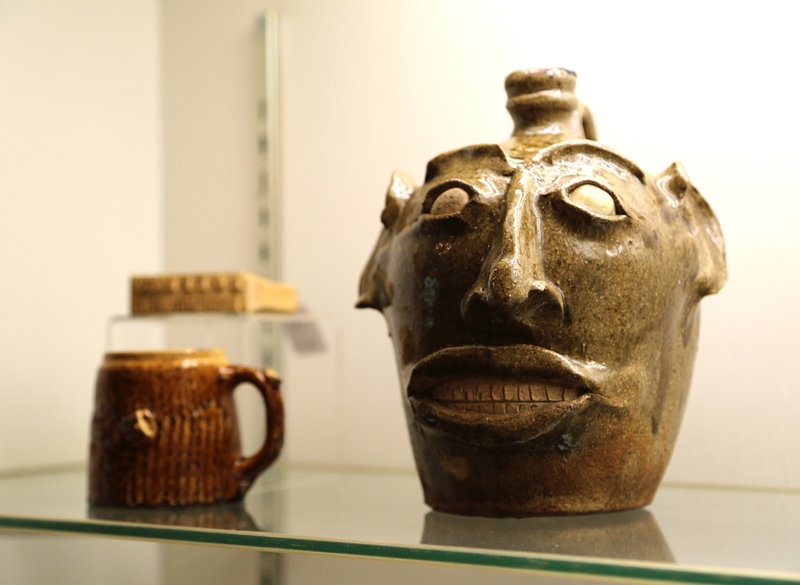 Only eight Anna Pottery fair jugs are known to exist. Two of them, this one included, surfaced in 2011 at Rock Island Auction from the Richard Ellis collection. 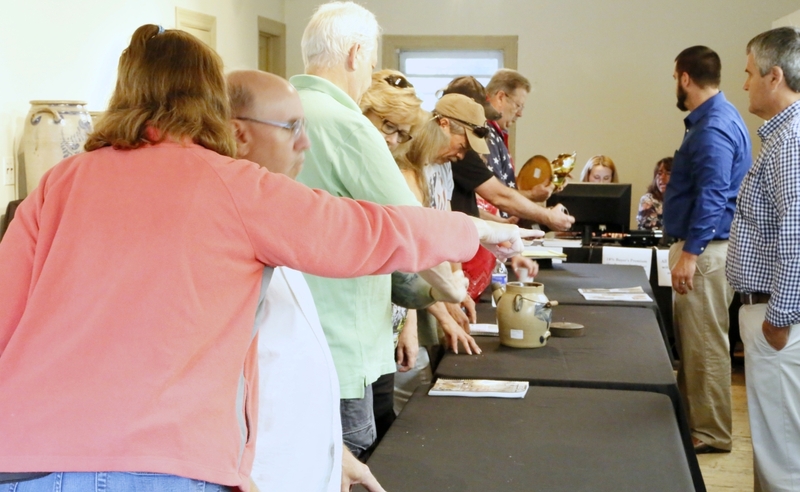 The result for the same jug at that auction was $80,500, meaning the jug held a steady value for the past seven years. Florida collector Martin Kaye was on hand for one reason only: he wanted to add a lion to his pride. 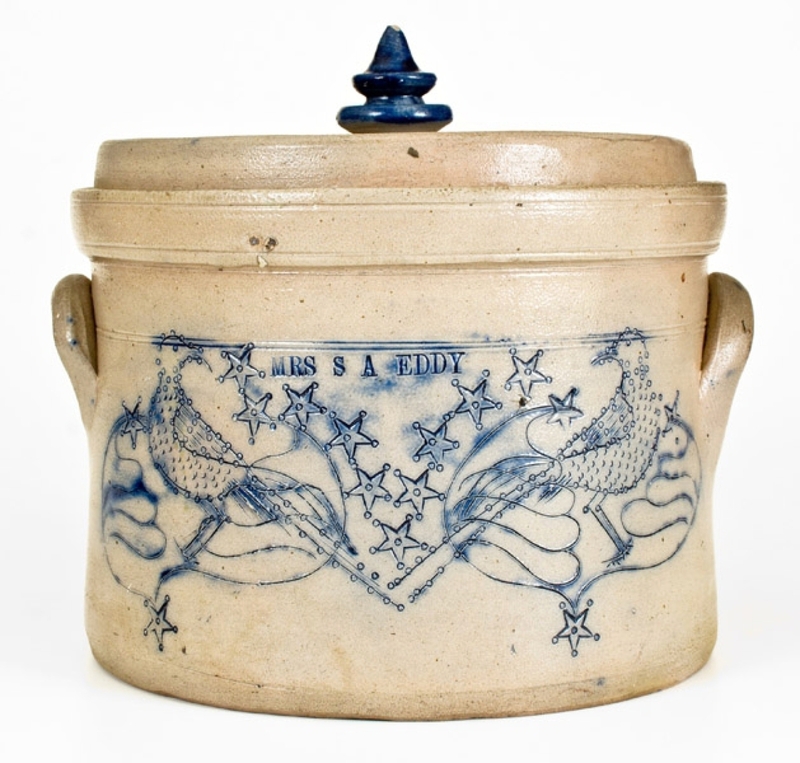 Kaye set his sights on the first lot of the sale, a circa 1880 six-gallon stoneware churn with cobalt lion decoration by Rochester N.Y., potter J. Burger Jr, which sold for $44,250. Both Kaye and Zipp agreed that this was one of the finest Burger Jr pieces they had ever seen. Zipp said, “It’s the best color I’ve ever seen on a J. Burger Jr piece, and it’s in the best-of category for the maker,” while Kaye added, “Pieces like these don’t just show up every few months, but maybe once a decade.” The lion will be the fifth in Kaye’s collection. Auctioneer Tony Zipp stands at the podium, taking bids. 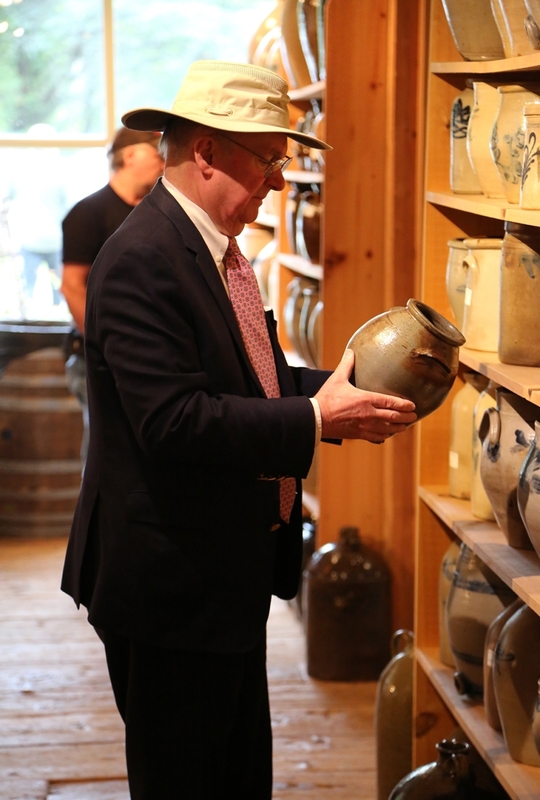 The jug was touted as a recent discovery out of the estate of Clive W. Bridgham (1951-2018) of Barrington, R.I., where it was found in a closet. Bridgham was a relative of Samuel W. Bridgham (1775-1840), the first mayor of Providence, R.I., and some of his effects were sold in the same estate sale. As detailed in the catalog description, the Bridgham’s had more than one connection to South Carolina, and it was surmised that the jug traveled to Rhode Island through one of them. The same was true about another piece in the sale, a tanware pitcher with profuse Albany slip decoration from New Geneva or Greensboro, Penn. 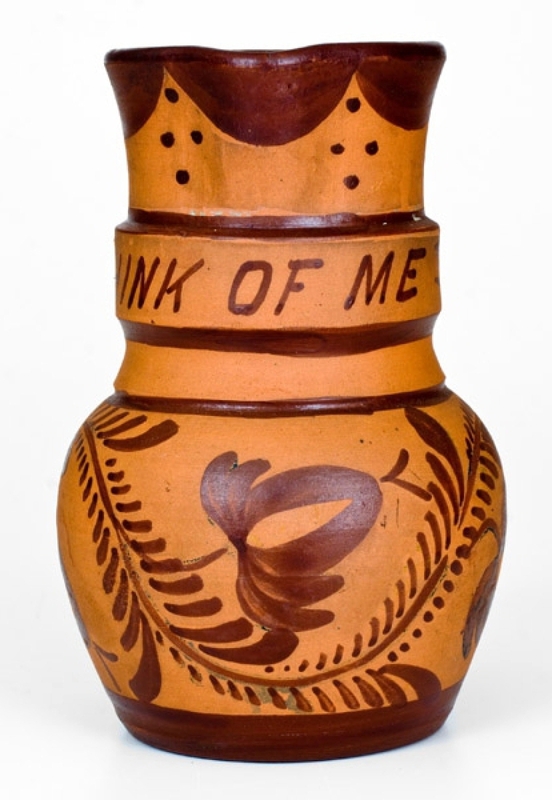 The piece may have been a love token, as “Think of Me” was written around the body at the base of the neck. According to Tony Zipp, the consignor had purchased it for $15 from a consignment shop in California and sent in pictures on the sale’s deadline day. Zipp told him, “Sure, we’ll take it. Ship it over.” It brought $3,540. Two large Daniel Seagle works were expected to do well and did not disappoint. 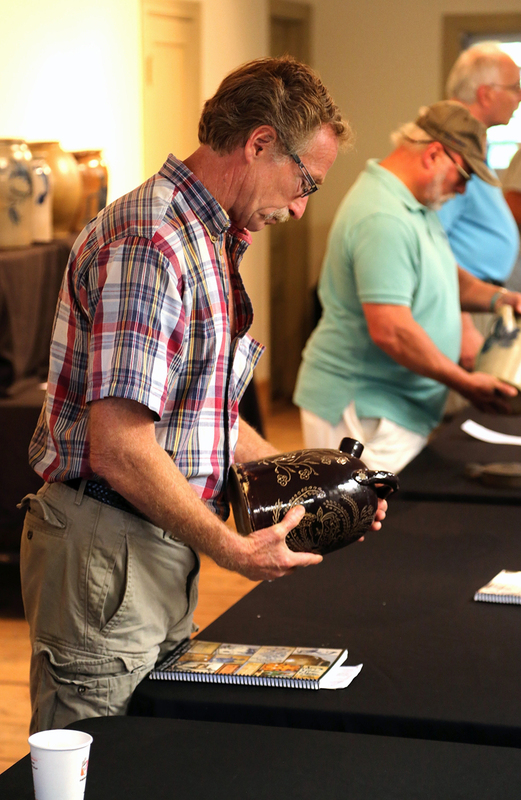 A 10-gallon double-handle jug took the higher of the two at $12,980, while the four-handled jar brought $11,800. 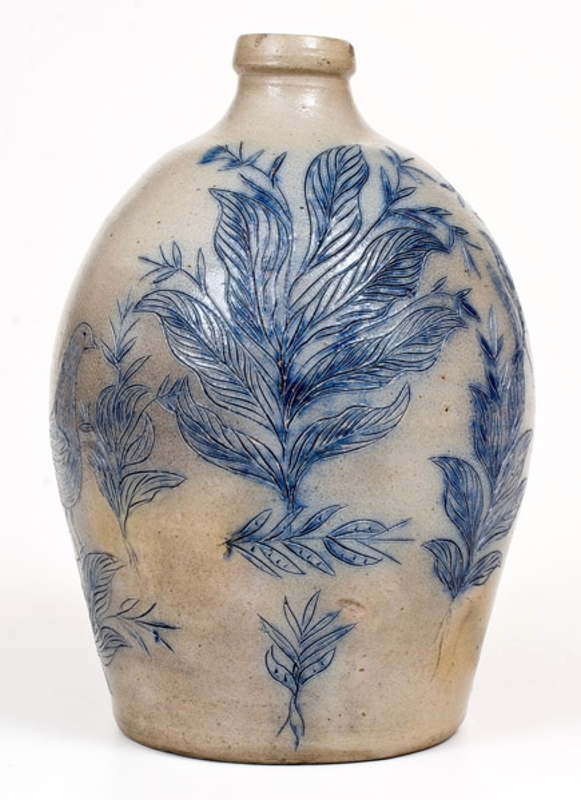 “It took a ton of clay to make these,” said Mark Zipp, as he pointed to the double-handled jug’s blue and white streaks that ran down the piece and gave it a special flair. “These are Rutiles,” he said. “They’re titanium dioxide glass runs. So they would rest a piece of glass at the top of the piece when they fired it, and it would melt and create that blue color. It’s very desirable in southern pottery.” Seagle is in the collection of a number of museums, including Colonial Williamsburg. 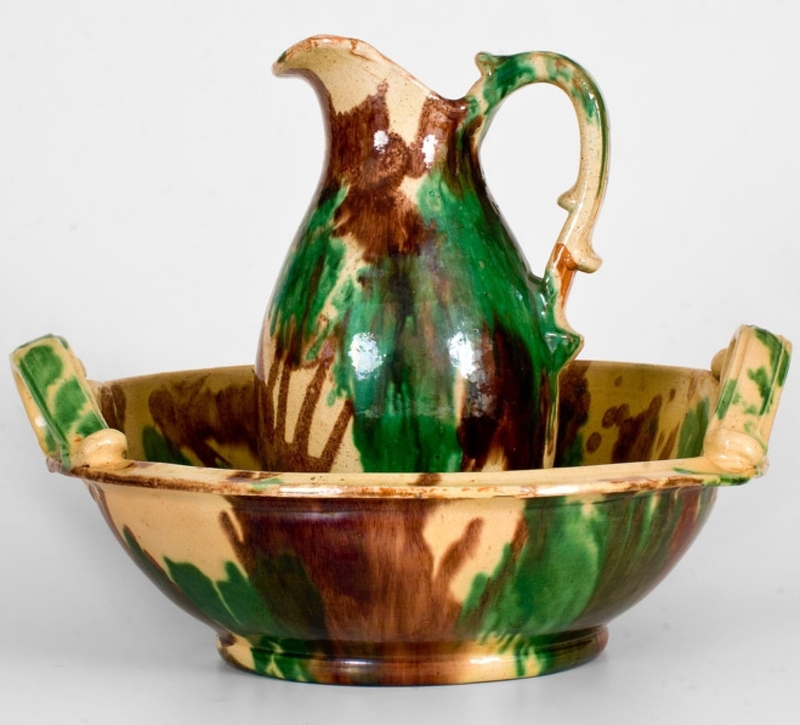 He was the premier maker from Lincoln County, North Carolina, and his monumental pieces, with their greenish-brown alkaline glazes, went to different buyers. 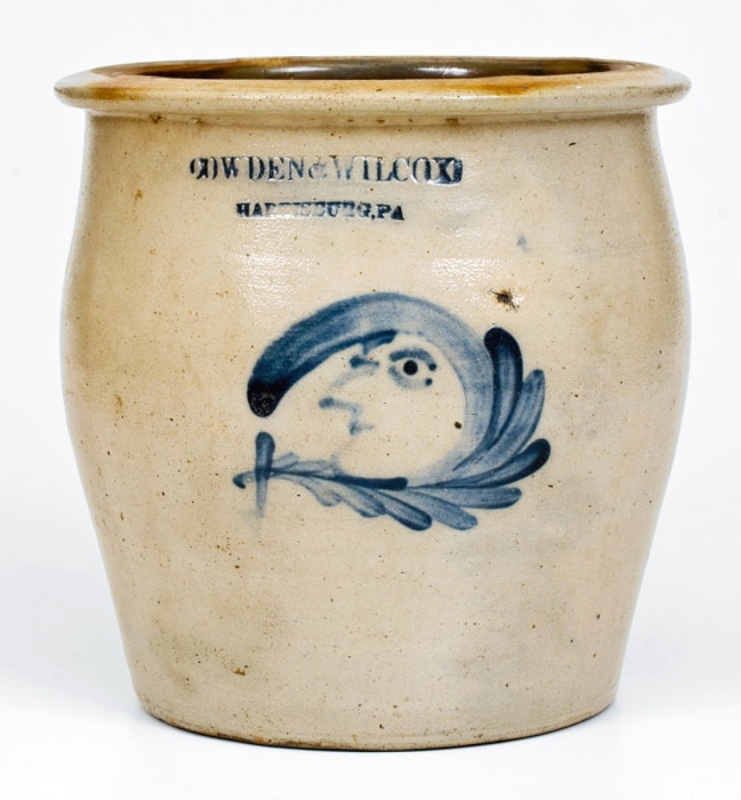 A Civil War stoneware crock from J.B. Pfaltzgraff, York, Penn., almost doubled its $8,000 high estimate to land at $15,340. 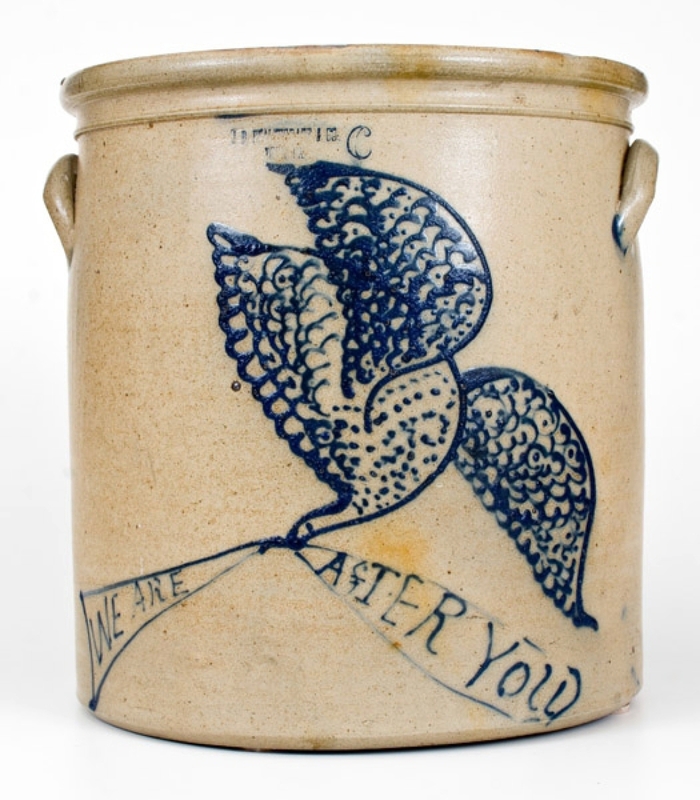 The piece featured a cobalt flying eagle pulling a banner that read “We Are After You.” Mark Zipp believed that the inscription was an angry response from the York pottery after the Confederate major general Jubal Early occupied the town and held it ransom in 1863. From his research, Zipp said the York townspeople described the Confederates as a disgusting horde of soldiers who took over the streets. Early demanded $100,000 in exchange for not sacking the city, but was satisfied with the $28,600 that the town scrounged together before he headed out two days later on orders from general Robert E. Lee. 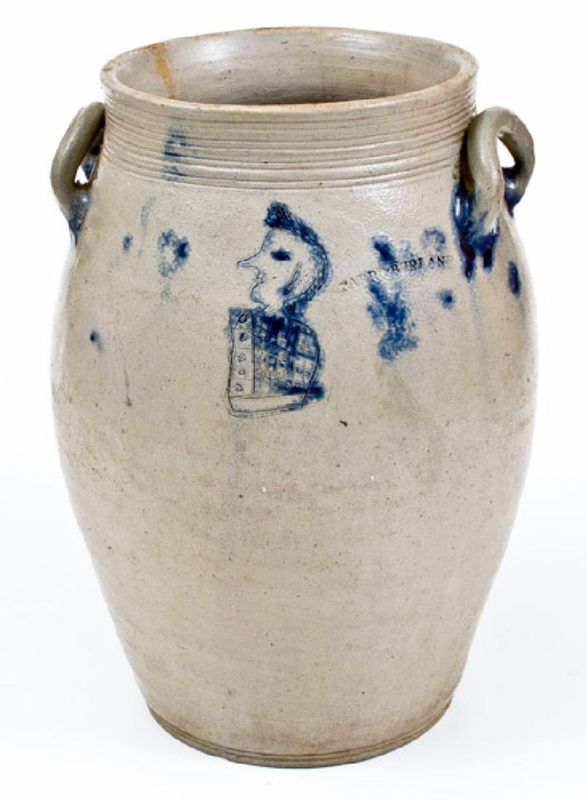 Mark Zipp holds the top lot of the day, an Anna Pottery fair jug. 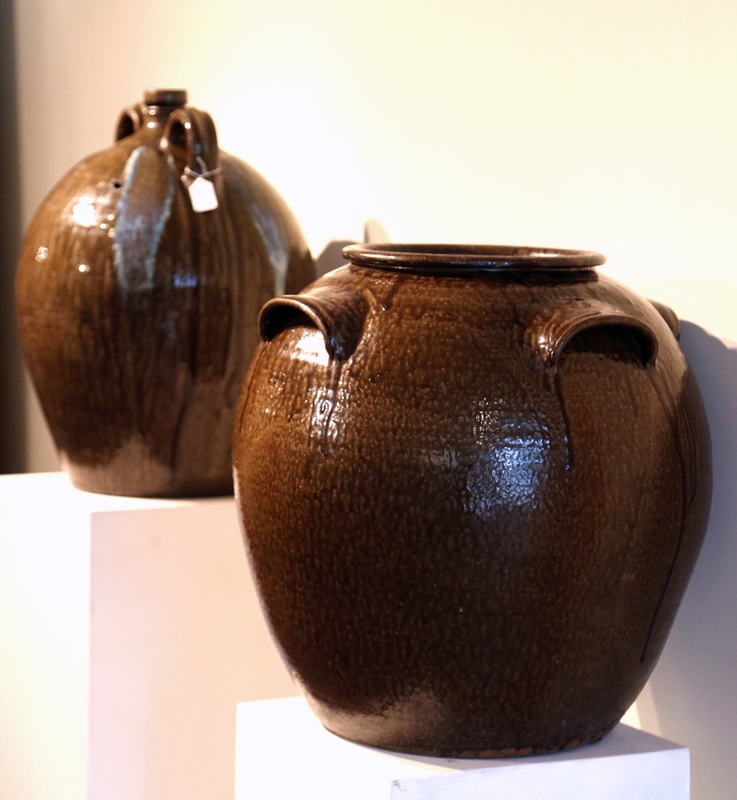 Another standout in the sale was a personal effect from the Manhattan Crolius family potters. 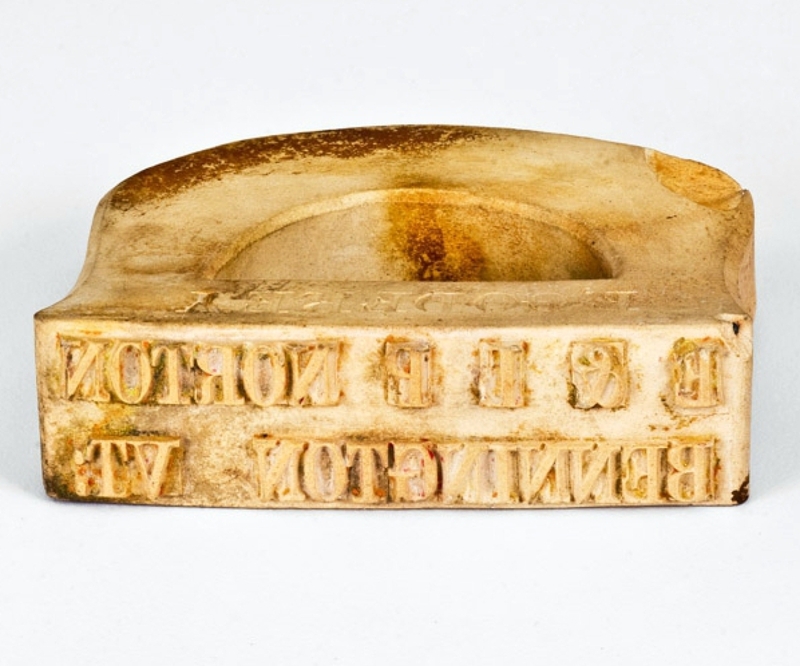 Selling for $17,700 was an inkwell made by John Clarkson Crolius for his father, Clarkson Crolius Sr. 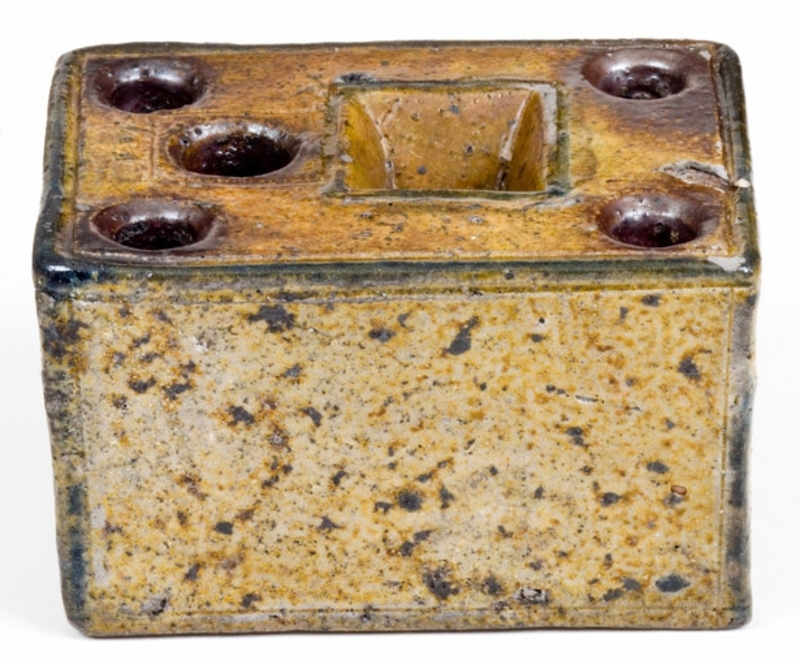 It is the second Crolius family inkwell known; the other is on display at the Metropolitan Museum of Art. John C. Crolius was Clarkson Crolius’ eldest son, though he died at the age of 27. 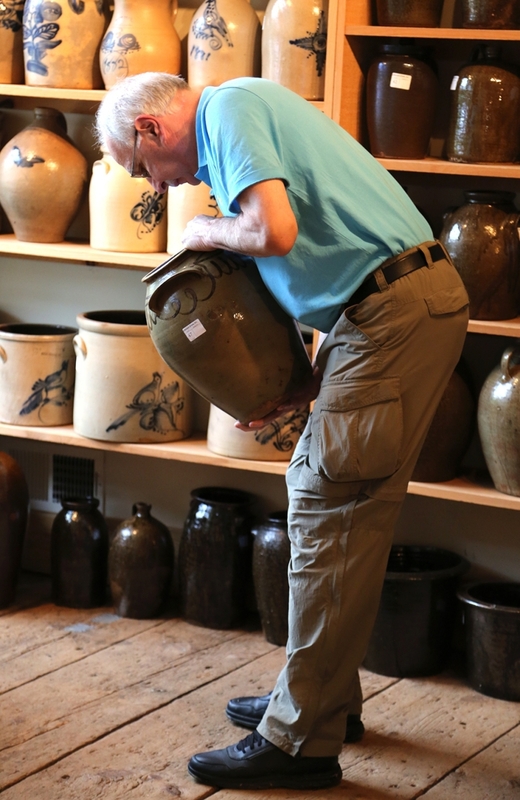 He is thought to have potted at the family’s second stoneware manufactory on Bayard Street. The work sold to a Southern American collection. 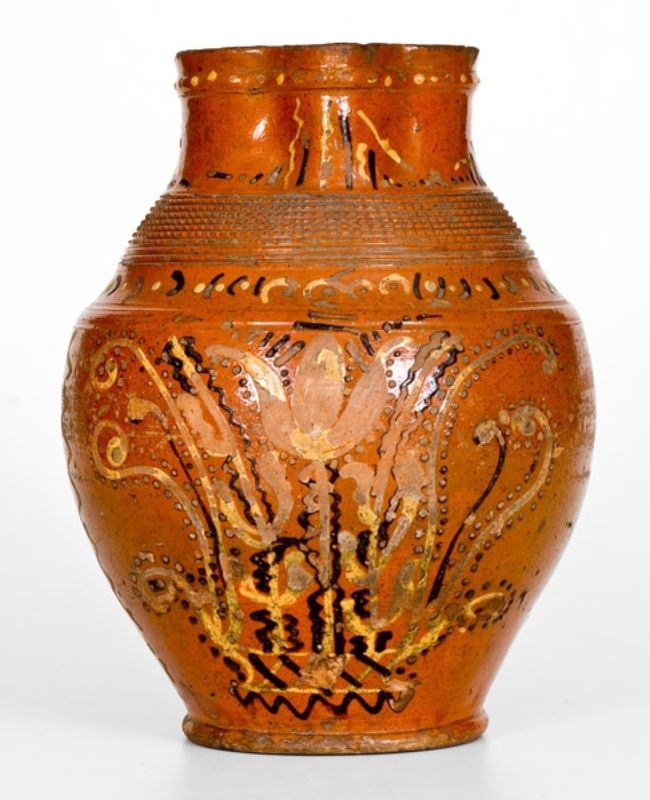 “This is one of the most exceptionally decorated Alamance County, North Carolina redware pieces we’ve ever had,” Mark Zipp said, on a pitcher that brought $16,520 on a $2,500 high estimate. The piece was fresh-to-the-market, having recently surfaced in Ohio, and featured profuse decoration in a manganese and yellow slip. Even with some surface wear and glaze loss to the central tulip decoration, bidders found it irresistible. 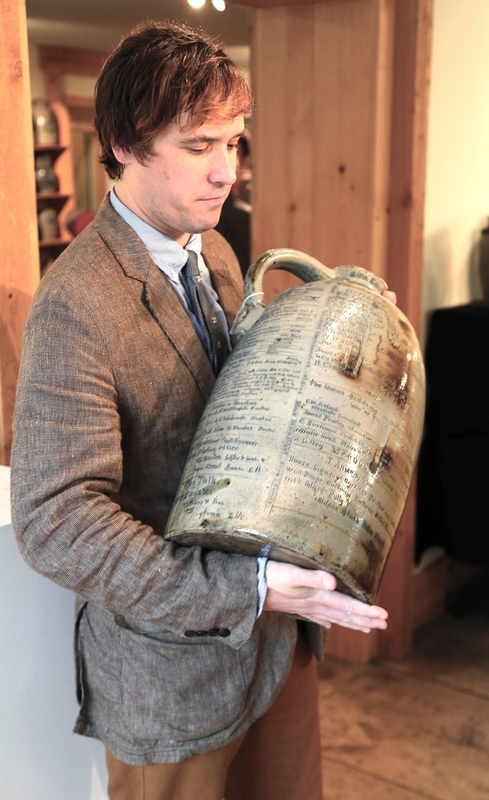 It sold to a North Carolina collector, along with the Daniel Seagle jug previously mentioned. All prices, as reported by the auction house, include buyer’s premium. For more information, 410-472-2016 or www.crockerfarm.com. 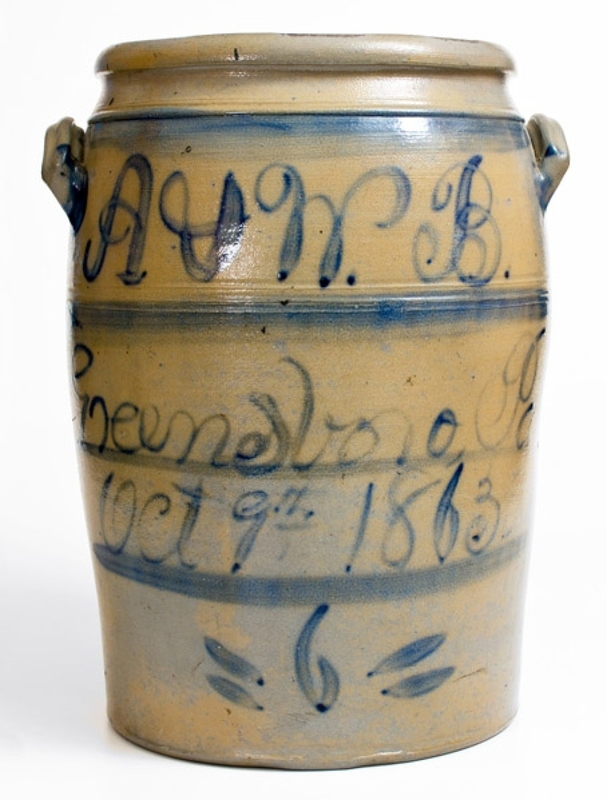 A six-gallon stoneware jar by Alexander and William Boughner, Greensboro, Penn., took $8,850. It featured free-hand decoration and signature, which is rare for the potter.